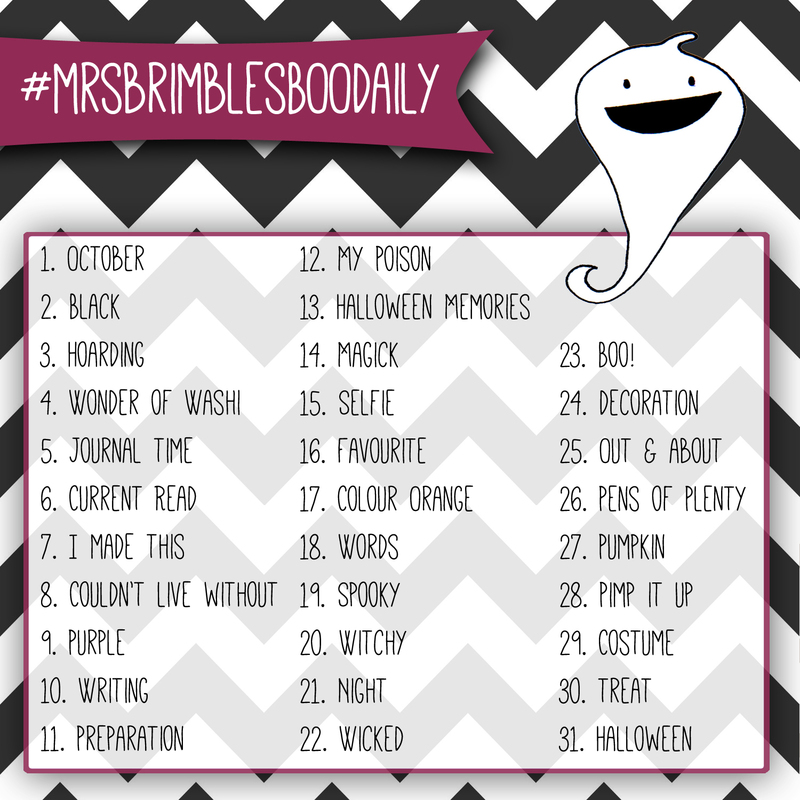 Mrs Brimbles: October Photo Challenges! REMEMBER as with all of my daily photo challenges I have designed the prompts to be interpreted in a way that suits you, loosely based on the things that I love: Planners (and planner decoration), Stationery, Journals, Art, Books, food, the season etc. You interpret them however you like but most importantly have fun with it. They are just prompts to help you. Ideally I would like to see the Facebook group filled with seasonal photos of your planners and journals more than anything though! Take them literally if you like or be imaginative. Use them as photo prompts or use them as journalling prompts. Anything goes! It's totally for fun so just share a photo every day. You don't have to enter to win the prize, you can just play along with the prompts for fun, entirely up to you, the more the merrier! If you want to play along for fun then start posting your photos now. Remember to use the hashtag: #mrsbrimblesoctdaily or #mrsbrimblesboodaily so that we can find your photos and see what you are up to. You can post anywhere on social media but if you want to be in with a chance of winning the prize it needs to be on instagram or in the Mrs Brimbles Happy Place group on Facebook (or both of course). If you are playing along with this in order win the prize please do make sure that you read all guidelines on how to enter and the rules below oh and if you want to be in with winning the prize you will need to register on the giveaway widget below too! You must post all 31 photos on instagram using the hashtag for the challenge you are taking part in. 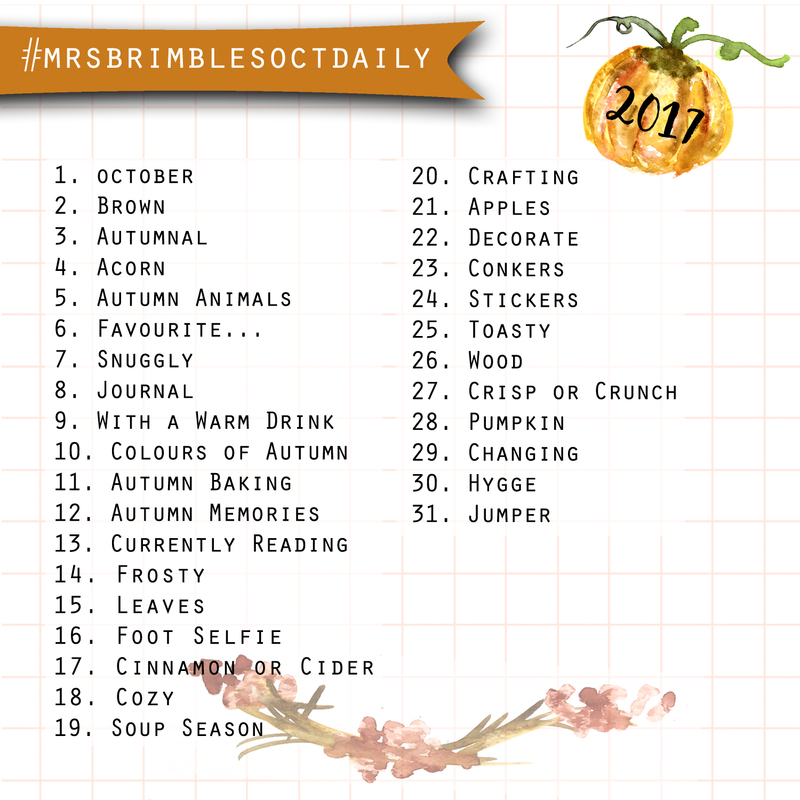 You may also want to use #mrsbrimblesOCTdaily2017 (although not compulsory) as the challenge is now in it's 4th year! You have until 7am GMT on 5th November 2017 to register for the giveaway on the widget below AND to complete the photo challenge on instagram. If you haven't registered on the widget you won't be elligible to win the prize so you will just be doing the challenge for fun which is totally fine with me if it is with you.You can register at any time from now but photo posting on instagram and in the Facebook group starts on 1st October 2017. You DO NOT have to post everyday but you do have to post all 31 photos by 7am GMT on 5th November 2017. You DO NOT have to post in numerical order, you can post any prompt on any day and any number of photos on any day. Once the competition has closed a winner will be drawn by random using the giveaway widget, and emailed. I will ask you to confirm / prove that you have posted all 31 photos in the time frame 1st October - 5th November 2017, if not another winner will be chosen. The winners name will appear on the giveaway widget once closed.